The Costa de Prata is situated on the western coast of Portugal, covering a distance of some 200 km, between Ericeira to the north of Lisbon and Espinho which is tjs the south of Oporto. By Air International airports in Lisbon and Oporto. There are also aerodromes in Espinho, Lousa, Torres Vedras, Coimbra and Leiria. By Rail This area is situated between the capital and the north of the country, and the modern and comfortable rail services, such as ALFA, stop at Coimbra and Aveiro. By Road The main thoroughfare in the Costa de Prata is the A1 motorway, which crosses the IP5 in Aveiro. The IPS also provides inland connections. Coimbra is connected to the IP5 by the IPS. The average temperatures in this region are about 18�C/64�F in summer and about 15�C/58�F in winter. This is one of the loveliest and most diversified areas of the country, with plenty of natural features from the mountains to lush valleys, small villages and beaches flanked by high sand dunes. In the Costa de Prata you will find the Natural Park of Serra de Aire and Serra de Candeeiros, known for the Grottoes of Santo Antonio, Mira de Aire and Alvados, all of which have fantastic stalactites and stalagmites. Just outside Coimbra, the Roman ruins at Conimbriga show traces of the Roman occupation of the Iberian Peninsula. The region is full of historical landmarks, such as the Castles of Leiria and Ourem, both connected to the birth of the nation, and the Pinhal de Leiria, a pine forest planted on the orders of King Dinis. Several monasteries show the presence of religious orders that were very important to the consolidation of the Portuguese nation. The Convent of Christ in Tomar dates back to the Knight Templars, while the Alcobaca Monastery bears witness to the presence of the Cistercian Order in Portugal. The magnificent Monastery of Santa Maria da Vitoria (Mosteiro da Batalha) was built to celebrate the Portuguese victory at the Battle of Aljubarrota. The extensive ocean beaches of the Costa de Prata offer ideal conditions for practising many kinds of water sports, among which are surfing, swimming, windsurfing, rowing and sailing. Pleasant boat trips can be taken on the Aveiro lagoon. The region is rich in spas, among which are Curia, Luso and Monte Real, some of the most important in the country. They are open to the public from April to October. There are three golf courses on the Costa de Prata - the Botado, Golden Eagle and Vimeiro. At Vimeiro, horse riding is also available.
' There are important, traditional festivities held in the area. Some of the best are the Festa dos Tabuleiros which takes place in Tomar in July, and the Queima das Fitas which has to do with University life in Coimbra. Casinos in Espinho and Figueira da Foz help to provide a varied night life. One of the best known gastronomic delights in the Costa de Prata is the Bairrada roasted suckling pig. There is also an abundance of shellfish from the extensive coastline. On the sweet side, try the egg sweets from Aveiro and Caldas da Rainha, little cakes from Torres Vedras and Tentugal, all bringing back memories of convent life which is where the recipies originated. It is in Costa de Prata that we find the main centres of the ceramic industry. Alcobaca deserves a special mention for its crystal factories that can be visited. Coimbra produces beautiful articles, including handpainted earthenwere articles. Vista Alegre is worldwide noted for its fine porcelain. Obidos is an enchanting medieval town encircled by walls and topped by a castle which is now a pousada. Nestling in the narrow streets are houses with flower-filled windows, Manueline porticos and historically evocative recesses. There are several pretty churches, such as the Renaissance Santa Maria church, the Misericordia Church (15th-18th centuries) or the Romanesque-Gothic Church of Nossa Senhora do Carmo. Near Obidos lies Alcobaca, the heart of the Portuguese ceramic industry, where you can visit the factories making both ceramics and crystal that is worldwide famous. When in Alcoba9a, visit the Santa Maria Cistercian Monastery, built in the 12th century and now on UNESCO's classified list of World Heritage. Only a few kilometres away, lies the Batalha Monastery, also classified by UNESCO. It is a fine example of Gothic and Manueline architecture began to be built in 1385, during the reign of King Joao I, to commemorate the Portuguese victory over the King of Castile at the Battle of Aljubarrota. In the pantheon of the monastery, illuminated by stained glass windows, lie the tombs of King Joao I and his sons, among whom is Henry the Navigator, the mentor of the Portuguese Discoveries. Once you are in this area, it is natural that you should want to visit Fatima, one of the most important Marian centres in the world, visited by many thousands of pilgrims every year. In Tomar, another example of Manueline architecture is the famous Chapter window in the Convent of Christ, headquarters of the Knights Templars. Also in Tomar, there is the castle built by Gauldim Pais, master of this order, in 1160. His name is also associated with the picturesque Almourol Castle, built on a small rocky island in the middle of the Tagus river. Bucaco is famous for its Natural Park, where there is a Neomanueline palace, a luxury hotel today. Nearby, in Mealhada, take the opportunity to have lunch and try one of the most typical dishes of the Costa de Prata, Bairrada roasted suckling pig accompanied by the famous sparkling wines produced in this region. Coimbra has one of the oldest universities in Europe. Famous for its student traditions and characteristic fado (doleful, romantic music and singing), Coimbra looks out over the river Mondego which forms a charming frame for it. Worth visiting are the Romanesque Cathedral, the Santa Cruz Church, the Monastery of Santa Clara, and the University buildings which include a celebrated tower, an important Baroque library and a chapel covered with glazed tiles with a Manueline portico. In the Machado de Castro Museum, housed in an old episcopal palace, an attractive Renaissance "loggia" offers one of the best views of the city. It gives way to the valuable collections of the Museum and to the Roman criptoportic where the Museum is built over. Aveiro is a pretty town, crossed by a maze of canals and surrounded by the blue waters of the ria (lagoon) de Aveiro. There is a museum here which houses important Portuguese Baroque art. 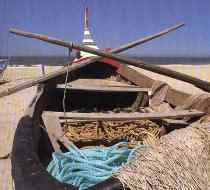 The boats used to collect seaweed are famous in the region for their lively, bright colours. Nearby is the Vista Alegre porcelain factory, with its interesting museum, well worth a visit. The Vista Alegre dinner services have become famous all over the world, from the White House, in America, to Royal Houses all over Europe. There is a good variety of hotels on offer in the Costa de Prata, including one 5-star hotel and eleven 4-star hotels. There are six pousadas, one in an historic building and another in an historic area, and all are noted for their elegance and service. Some of these pousadas are part of the Hoteis de Charme network - hotels with an accent on Portuguese tradition. One of these hotels is the Hotel Palace do Bucaco, an ideal place to host incentives. Also the University buildings in Coimbra are a suitable and unusual place to hold functions in an artistic and cultural atmosphere. The region also has nineteen manor houses offering accommodation, many of them situated in leafy parks and tranquil settings.